Comfort, quality, size, functionality, price, and color are factors to consider when shopping for furniture for the radiology reading room. The radiologists who use the equipment are most likely to say comfort is most important. Long hours at a workstation puts radiologists in uncomfortable positions that both increase their risk of injury and can make them less productive. To meet the demand for comfort, manufacturers are making radiology furniture and related products for home or office use that emphasize ergonomics. Workstations, as well as related equipment including monitors, keyboards, chairs, cable management systems, mice, and telephone features, continue to be increasingly designed to be easy to use and comfortable. Radiologists and reading room planners who are looking to buy a more comfortable workstation can choose from a wide selection of models that can be adjusted to accommodate more than one user in much the same way the buttons on a car’s driver seat allow the seat to automatically adjust to more than one driver. In addition to customizing workstation settings, the capability to adjust between positions keeps users moving, which is healthier, and keeps their blood flowing, which can maintain alertness. Workstations allow users to quickly adjust to a sitting or standing position with a touch of their own buttons. Users can adjust the workstation to accommodate their height and desired degree of tilt using buttons or cranks created by manufacturers who recognize that users come in different sizes and have different comfort needs. Radiologists who are in the market will have a choice of one- or two-surface workstations. Desks with separate surfaces in the front and back are said to optimize body positioning and comfort, since each surface can be adjusted by height in any position (eg, sitting, standing, or reclining). As far as the sizing of a two-tier workstation, the front tier can be 12 or 16 inches deep, while the back tier may be 16, 20, or 24 inches deep. Typically, desks are 48, 60, 72, or 84 inches wide. Degree of tilt also is adjustable. 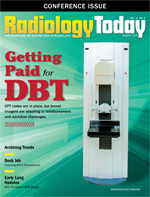 Radiologists may prefer the one-tier workstation because it offers a broader workspace. Work surfaces come in different shapes: banana, square, L, half-moon, diamond, hexagon, and corner. Before picking one, a radiologist or reading room planner should make sure the shape would work well in the space allotted. People who work at a desk crammed into an ill-suited spot may wind up adapting their positioning to the poorly fitting desk, which can lead to aches and pains. Some desk shapes fit well in corners, while others work better in an open area or against a wall. The desk also should be checked for sharp edges that can scrape a user’s arm, advises the Occupational Safety & Health Administration (OSHA); sloping or rounded edges are better. OSHA also suggests checking under the desk to make sure there is sufficient room for users’ legs and the variety of positions they will be in while working at the desk. Radiologists also will want monitors and display mounts that are ergonomically designed. Proper monitor height and distance minimizes visual fatigue, puts the head in the proper position, and relaxes the neck. Users will want to be able to effortlessly lift and lower the monitors, reposition the displays horizontally with an infinite range of positions, make adjustments to the angle of individual monitors in any direction without tools, and reposition all monitors without the fear of sagging over time. When looking for a keyboard, those that tilt ease pressure on the arms, shoulders, neck, and back. Radiologists typically want a workstation that can handle the weight from their monitors and that enables them to work in more natural positions. Good workstations have features that serve to enhance productivity on their own. For instance, realizing that radiologists like the ability to view their monitors in different arrangements, manufacturers offer numerous display options. Radiologists should review all of them to help determine the set-up that will allow them to be most productive. Monitors can be viewed as a single row, doubled up, paired up, or set on arms, to be viewed separately; it’s a matter of preference. Radiologists who work in busy and/or noisy environments may like their workstation fitted with modesty panels, which make it easier for users to focus on the task at hand. Radiologists may want workstations with surface extensions that can provide the extra workspace they need at times. The extensions can be folded down when they aren’t needed. Those looking for more storage space may like workstations that have a top shelf that spans the entire set-up. Workstation accessories that can make life a little easier for the radiologist include a phone/dictation arm, gooseneck task lights, a cup holder, and a pencil drawer. Radiologists also will want the workstation they purchase to be durable enough to withstand everyday, nonstop use, and strong enough to handle the load from the number of monitors they use. That shouldn’t be difficult since manufacturers know radiologists like to use as many monitors as possible. Smaller, equally sturdy models are, of course, also available. Radiologists often purchase smaller units for a home setting. Easy access to documents also saves time, so radiologists should consider the options of buying a separate side table or pedestal or a document holder to use on the desktop. Workstations that provide easy access to computer hardware also can save time when access is needed. Those that have computer hardware mounted on rails, directly to the underside of the work surface, are a good option because the rails allow the computer hardware to be pulled forward for service and administration. Such a set-up reduces the chance for cables to be disconnected by accident. A workstation should feature a system that will manage cables and keep them from becoming a problem. Color choice may matter when a radiologist is working to tie in the color to a home setting or when a facility is looking to match new pieces to existing equipment. Color choice also may be just a matter of personal preference. Whatever the case, radiologists will be able to choose from a rainbow of home- and office-friendly colors, such as black, gray, putty, mahogany, natural, and cherry. They may select matching or different colors for workstation tops, frames, and molding. A good chair is key to being healthy and productive. Using the wrong chair can result in back problems and pain, so a workstation needs to include as quality a chair as possible that works with the desk. A good chair is easy to adjust and has a backrest that provides lumbar support that matches the curve of the user’s back, OSHA suggests. Chairs with a back that can only tilt forward and backward are not a good selection, OSHA points out, because they can’t be adequately adjusted for a wide range of users. Among the radiologists seeing and feeling the benefits of the ergonomic radiology furniture is Woojin Kim, MD, formerly a musculoskeletal (MSK) radiologist at the University of Pennsylvania. Kim, now the director of innovation with Montage Health Solutions, was with Penn’s department of radiology when it purchased eight new workstations for a new reading room at Penn Medicine University City, a building that opened in August 2014. Four existing workstations were retrofitted with some upgrades and brought in from the two prior reading rooms to make a total of 12 workstations in the new MSK reading room. Kim believes facilities need to put greater emphasis on making reading rooms more ergonomic since radiologists can routinely spend eight to 10 hours a day (or more) interpreting images. He also believes reading rooms should get higher priority when it comes to space allotment. Sharing his own experience, Kim says he and his coworkers like the ability to adjust the tabletop and monitors’ height individually (not individual monitors, but as a group). They also appreciate the flood lighting in the back, which minimizes eye fatigue, and the fact that they can use the outlets on the tabletop to plug in personal items, such as phones and laptops, and still have enough tabletop space. All of the new workstations installed in the new MSK reading room were purchased from RedRick Technologies, in Ontario, Canada. The company, whose regional partner is Evolve Technologies Corp in Salem, New Hampshire, shares a great deal of online advice about setting up an ergonomic radiology reading room. For greater efficiency when workstations are shared, Kim suggests setting up every workstation the exact same way (eg phone on the left and task lighting on the right). Those who design the room, he says, should take note of the lighting in the room during normal working hours and take steps to avoid the chance of any direct light reaching the workstations and monitors during that time, since that can cause glare. Emphasis also should be placed on noise reduction by using sound-absorbing ceiling materials, wall panels, and side panels. Penn also installed special flooring in its MSK reading room to allow easy cleaning and movement of chairs. Another satisfied customer is Richard Farb, MD, from Toronto Western Hospital’s Joint Department of Medical Imaging. He likes the sit/stand desk he purchased a few months ago. What he appreciates most about the set-up is not only the ability to stand but also the ability to move around as he stands. “There’s been some literature saying that sitting is the new smoking. I wanted to stand more and feel better at the end of the day,” he says. Farb also appreciates the fact that the desk he bought from Xybix can accommodate the load from up to 10 monitors. “That’s a significant amount of weight,” he explains. The ability to put 10 monitors (20 in) on the desk enables him to read images and text at the same time without continually juggling application windows. He says he uses four of the monitors for reading images, and the remaining to review ancillary data. To accommodate the monitors, he purchased an 84-inch wide desk, based on a company representative’s insight. “I've got two sets of four doubled up and then two monitors on either side, which I put on arms,” he says. 1. Determine your preference for a corner or a straight configuration. 2. Measure the width of all your monitors and total them up. Add one-half inch per monitor (or your preferred gap) for the space between each monitor and add that to the total. The resulting total is the linear inches of monitors that need to be supported. 3. Select a table size that supports the required linear inches of monitors. Select a larger size if you have space and think you may upgrade to more or larger monitors in the future. Biomorph, a New York City-based provider of radiology furniture, believes the key to comfortable reading is an active workstyle that includes sitting as well as standing, and frequent changes of working position, says president Stephen Barlow-Lawson. He adds that whether you use a dual- or single-surface desk, it should have a wide height-adjustment range of 22.1” at the lowest to 48.6” at the highest, which are ergonomics standards supported by the State of California, the American National Standards Institute, and the Business and Institutional Furniture Manufacturers Association. This range allows from 5-foot to 6-foot-6, which is the height of 95% of people, to attain correct ergonomics position of a 90° angle at the elbow when typing and mousing, and the same angle at the knees when sitting. There are numerous factors to keep in mind when purchasing ergonomic radiology furniture. Take the time to involve reading room designers with experience in ergonomics, and/or manufacturer reps to help radiologists and administrators assess their needs, create a plan, select the most appropriate product, and see it through to installation.